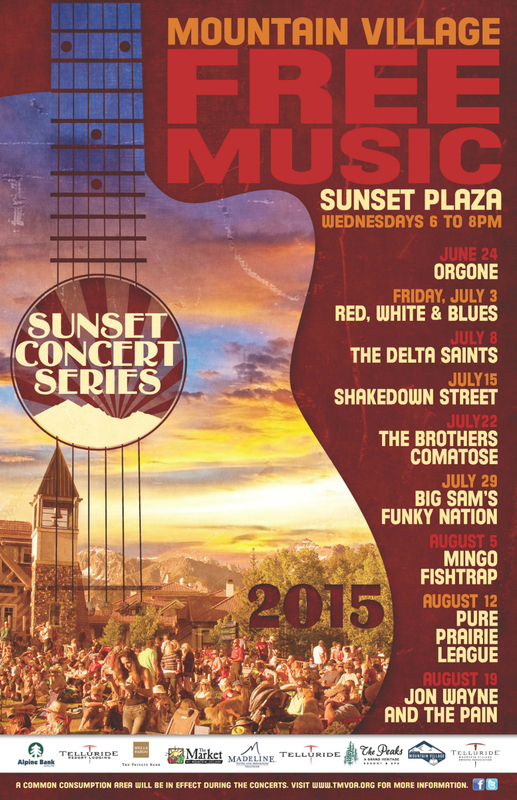 TMVOA is proud to host another season of nationally touring live music talent every Wednesday at 6 p.m. in Sunset Plaza, Mountain Village. Now in its 16th year, the free outdoor live music series overlooking the scenic valley returns with the progressive funk and soul of Orgone, New Orleans brass band Big Sam’s Funky Nation, Americana and bluegrass outfit The Brothers Comatose, Nashville rock ‘n’ rollers The Delta Saints, electronic-laced reggae act Jon Wayne and the Pain, rhythm & soul ensemble Mingo Fishtrap, country-rock band Pure Prairie League, and Colorado’s Grateful Dead tribute Shakedown Street. The eclectic lineup enlists a powerful array of proven acts that provide feel good dance and sing-a-long music to audiences across the country. Scheduled to coincide with a scenic sunset as the backdrop for each act’s two sets of music on the lawn near Lift 1 in the Sunset Plaza, all nine shows are provided to the public free of charge by TMVOA, and supporting sponsors Wells Fargo Private Bank, Alpine Bank, Madeline Hotel and Residences, Telluride Resort Lodging, Telluride Ski & Golf, The Town of Mountain Village, The Peaks Resort & Spa, and The Market at Mountain Village. A returning feature of the event this year will be the Town of Mountain Village’s Entertainment District, allowing a fluid social atmosphere where alcoholic beverages purchased from attached restaurants can be taken into the Common Consumption Area and enjoyed during the concerts.